MONTHLY RENTAL - Please inquire for the monthly (30 night) rate! 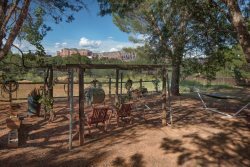 Beautiful Two story Town Home Located In West Sedona. Inside, this property boasts of many nice touches: Granite Counter tops, Electric fireplace, Beautiful linens, Stainless Steel Appliances and Tasteful Furnishings throughout, with Views! The Outside Back Patio Area has Plum Trees and Raised Flower Beds. This is Centrally Located close to Shopping, Hiking Trails, Movie Theaters, and Restaurants. Guest enjoy Sedona's stunning Red Rock Views. Located In Casa Del Sol Community. Owner's will permit some pets with a $200 Non-Refundable Pet Fee. This townhome is a real class act! We were very impressed with Cherry's professionalism and prompt responses to our emails or phone calls. She also demonstrated a strong knowledge base regarding the potential of another property. The townhome we stayed in was quite comfortable and spotlessly clean. The owner thought of everything that guests could possibly need or want when it came to day-to-day living. Since we stayed for over two months, we felt very much at home. Staff was wonderful, helpful, warm and kind. I felt like Royalty.It was the nicest property I have ever stayed in!! Definitely want to come back.